Most air compressors use electricity, gas or diesel to convert power into compressed air (i.e. air stored at pressures above atmospheric pressure, i.e. 101,325 pascals). 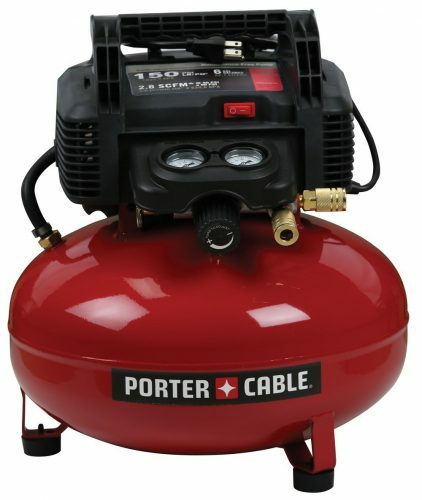 Compressed air contains potential energy, which can then be used for various domestic and industrial operations: filling up gas cylinders and tires; powering pneumatic tools such as jackhammers, blow guns and air hammers; supplying large volumes of pressured air for industrial processes; energy storage; air brakes; scuba diving; refrigeration. 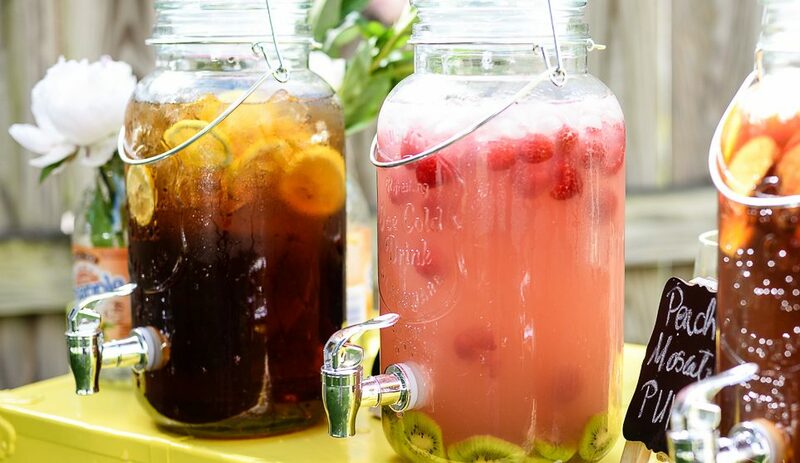 After electricity, natural gas, and water, compressed air is the most widely used utility in industrial processes. 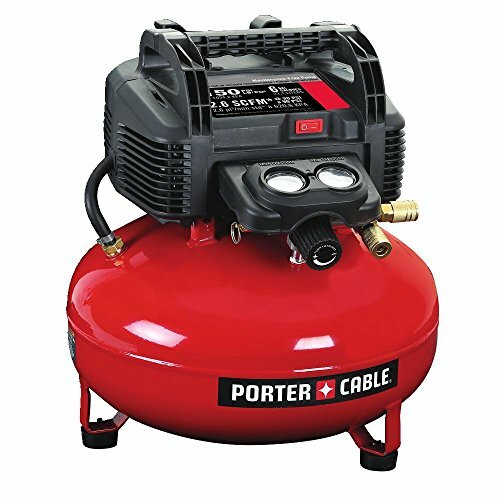 This Porter-Cable portable air compressor comes with a steel pancake design for optimum stability and is slightly larger and heavier (34 pounds) than the Kensun YS-205. 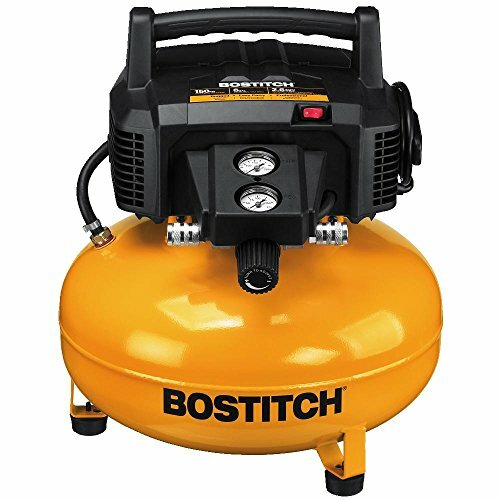 Its 6-gallon capacity – coupled with a maximum tank pressure of 150 PSI – allows it power air tools for a longer period of time. It also features 2.6 SCFM at 90 PSI, which allows for quick compressor recovery time – and 120 PSO cut-in pressure, which provides 30 PSI of ‘bonus air’. 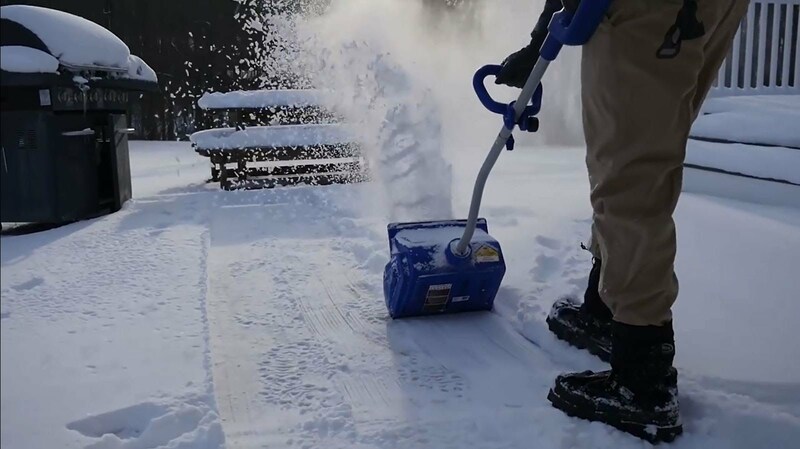 The oil-free pump removes the need for regular maintenance, while the low-amp, 120V motor allows it to start easily in cold temperatures. 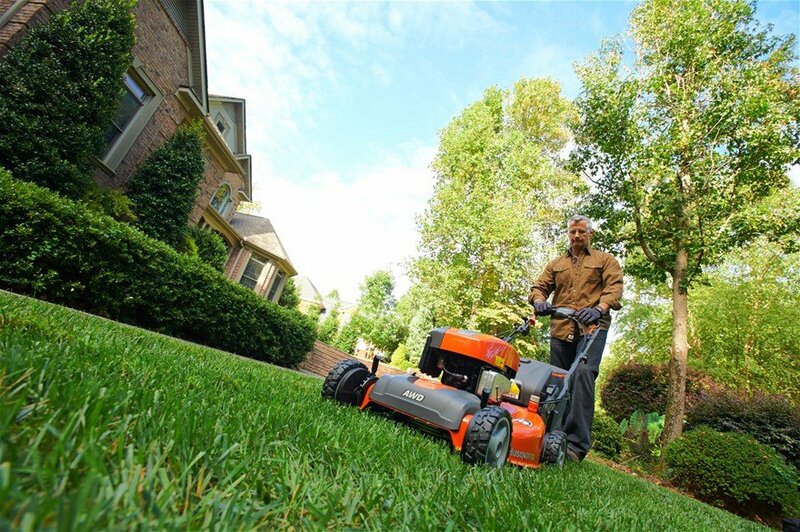 The C2002-WK also includes a one-year limited warranty on compressor components and a 13 piece accessory kit with the following accessories: a 25-foot nylon hose, blow gun and attachments, tire chuck, tire gauge, quick coupler, plugs, and Teflon tape. 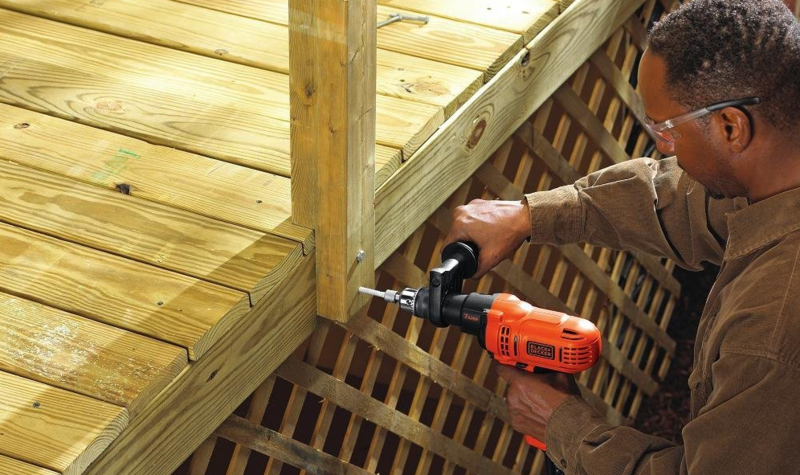 Equipped with an integrated carry handle, the Porter-Cable C2002-WK is readily portable and suitable for use with framing and roofing jobs, multiple trim finishing nailers, and most inflation, blowing and small size SCFM air tools. The Kensun YS-205 air compressor is the smallest and cheapest item on the list, being 11.7 inches in length and weighing only 4.7 pounds. As the product description suggests, it mainly serves as a multi-function inflator which operates under 12V (DC) or 110V (AC). 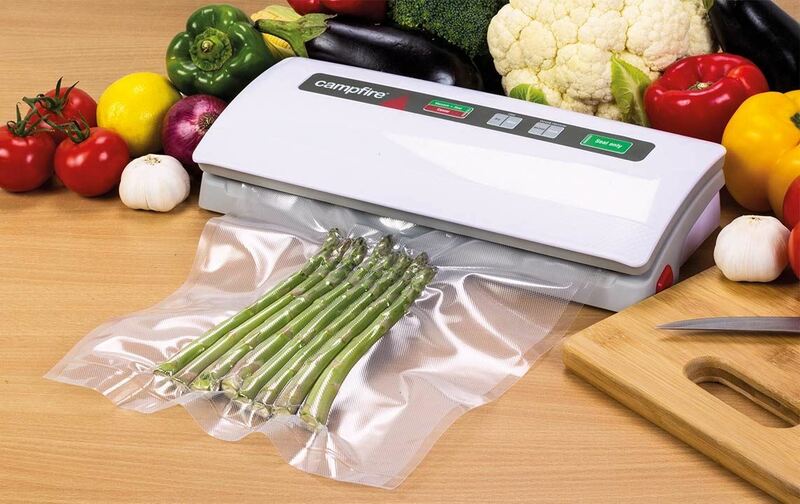 It comes with a 21.7-inch rubber air hose, which pumps air at a rate of 11 liters per minute (at a pressure of up to 40 PSI). With 9 feet and 10-inch power cord (with a cigarette plug) and a 6 feet 7-inch cord (AC plug), the Kensun YS-205 portable air compressor tire inflator can easily reach around even the largest SUVs and truck. 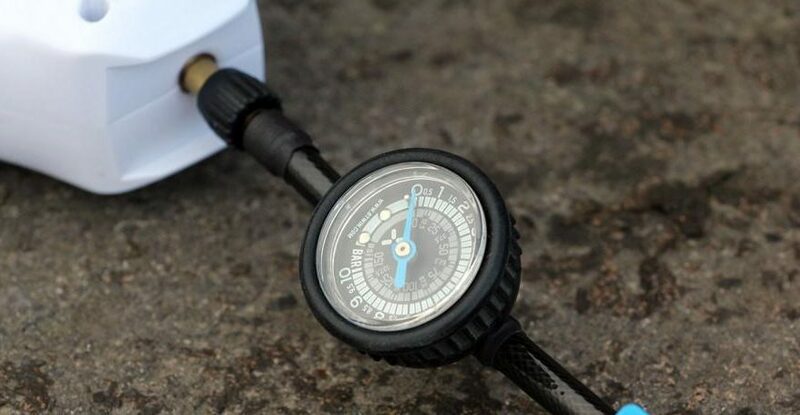 It can also be used to inflate tires for motorcycles, bicycles, and cars. Furthermore, the accompanying three nozzle adapters allow it to inflate rafts, basketballs, footballs, volleyballs, beach and pool toys, and air mattresses. 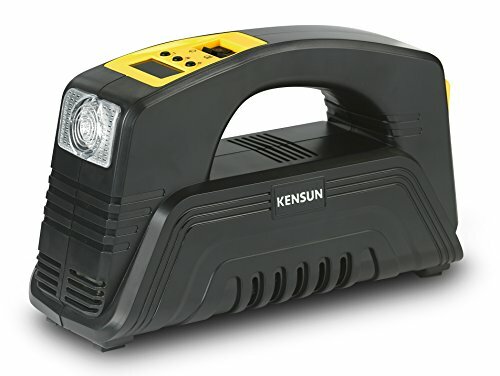 While not especially powerful, Kensun YS-205 portable air compressor tire inflator is a light, compact, mobile and handy tool that can see to all your inflating needs around the home. The DEWALT DWFP55126’s pancake design is similar to the Porter-Cable C2002-WK, and it also has a similar size (17.2 x 16.6 x 20.1 inches) and weight (30 pounds). It also has the same capacity (a 6-gallon tank) but comes with a greater maximum tank pressure of 165 PSI. It also features 2.6 SCFM at 90 PSI, which allows for quick compressor recovery time. 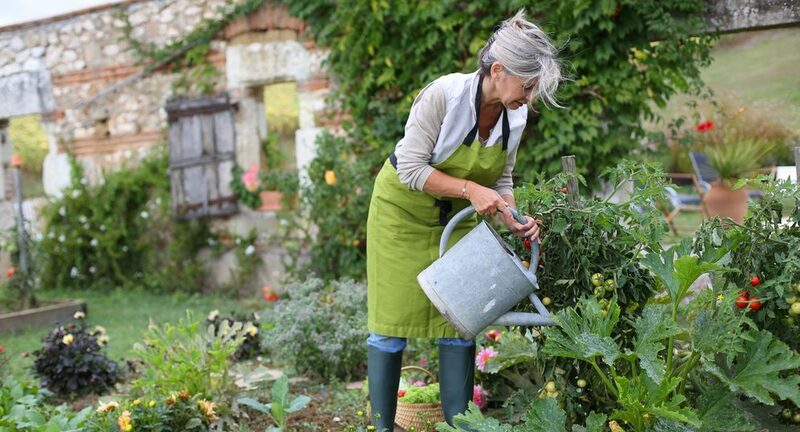 Like the C2002-WK, it uses an oil-free pump which removes the need for regular maintenance, has a high-efficiency motor that allows it to start easily in cold temperatures, and comes with a one-year limited manufacturers’ warranty. The DEWALT DWFP55126’s operates at a 75.5 dBA noise level, allowing it to be used in relatively quiet work settings. 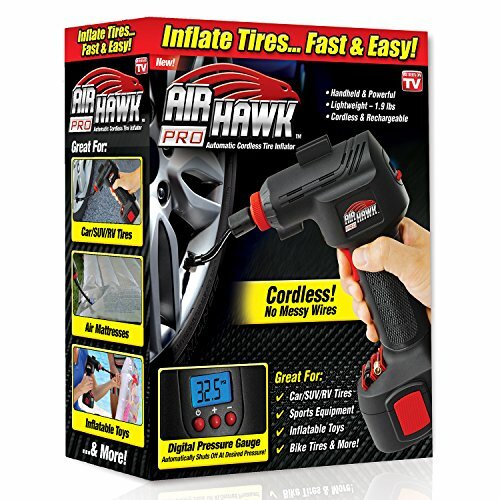 With its easy portability and pragmatic design (which allows for easy repairs, protection from damage, and easy storage), it is readily compatible with nail guns, tire inflators, and DIY projects around the home (but is unsuitable for more powerful tools or heavy industrial applications). 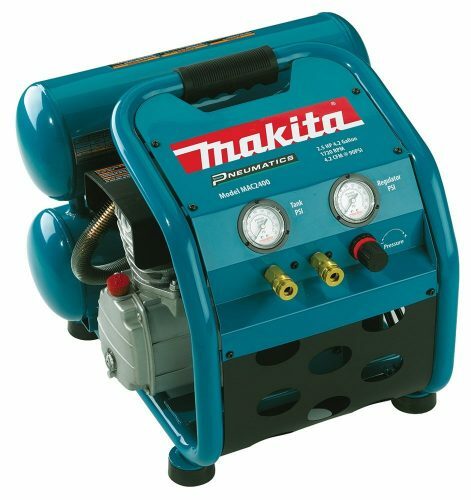 As its name indicates, the Makita MAC700 is relatively large, weighing in at 59.6 pounds and having larger dimensions than the other portable compressors: 18 x 22 x 10 inches. 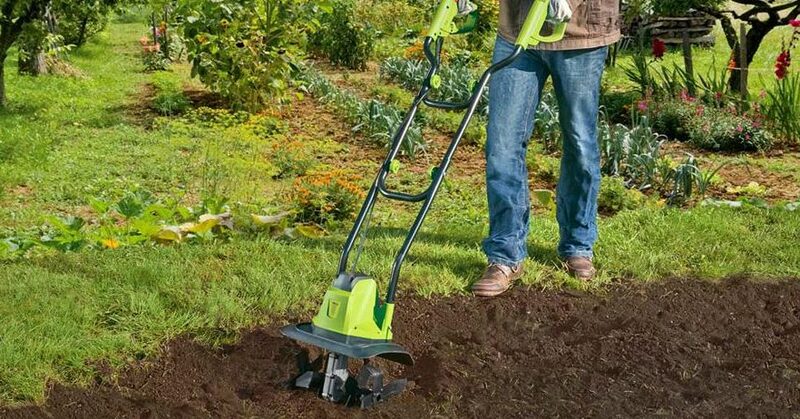 While it comes with a large carrying handle, it weighs almost twice as much as the other portable compressors. The additional bulk – a 2 HP motor, Makita’s Big Bore engineered pump cylinder and piston, a 2.6-gallon tank – allow it to provide high levels of power while providing enhanced durability for tough job-site environments. 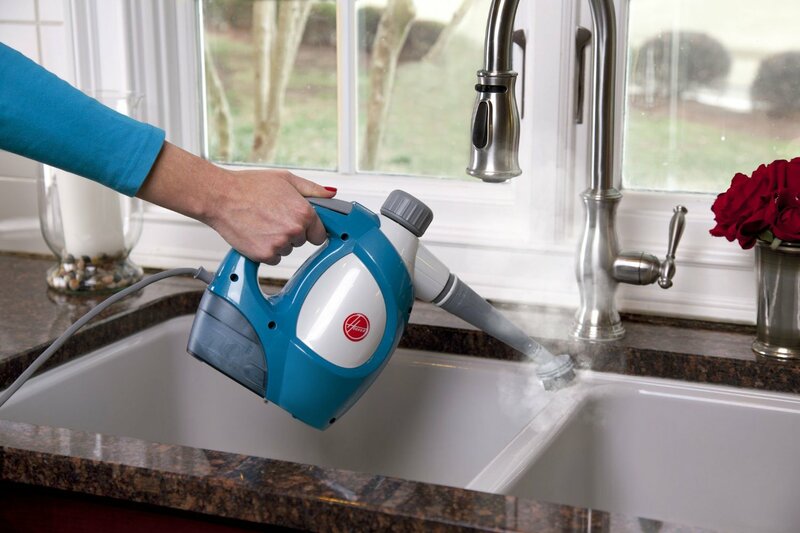 The Makita MAC700 operates at comparative noise levels to a dishwasher or garbage disposal (below 90 dB). It is also relatively more efficient, delivering 40PSI (3.8 SCFM) and 90 PSI (3.3 SCFM). 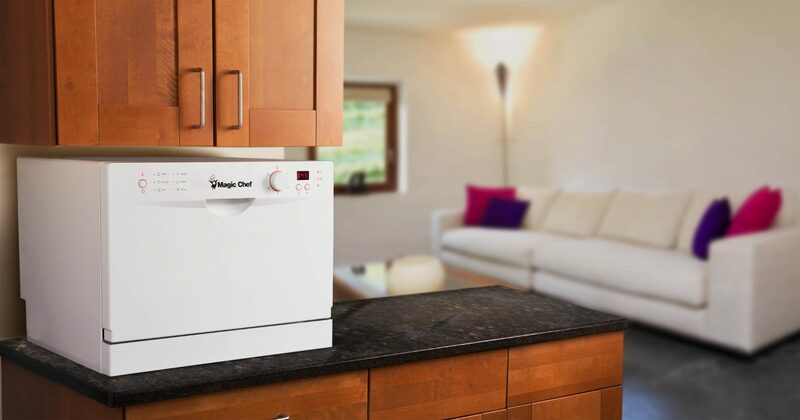 It also includes features that allow for easier maintenance, protection against everyday wear and tear, and efficient heat dissipation. 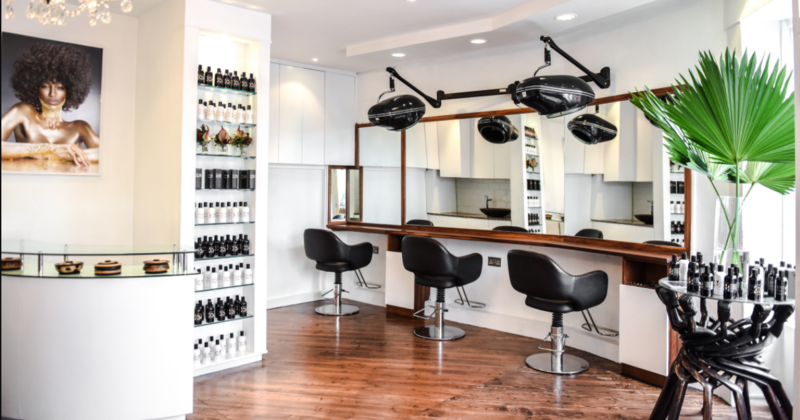 It comes with a 1-year warranty, and is designed for home DIY, automotive, and non-intensive professional use, e.g. nailing, stapling, moderate airbrush work and low airflow operations. 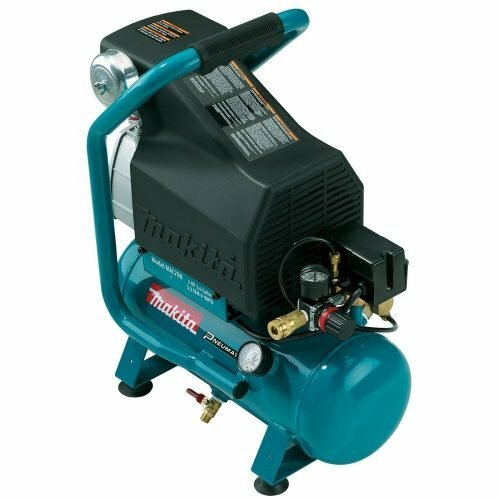 As befitting its relatively hefty price tag, the Makita MAC2400 is the largest portable air compressor in this list, weighing in at 81 pounds and having the largest dimensions: 20 x 18 x 18.8 inches. As such, combining it with a dolly may be necessary for it to actually be ‘portable’ and easily transported around your job site. 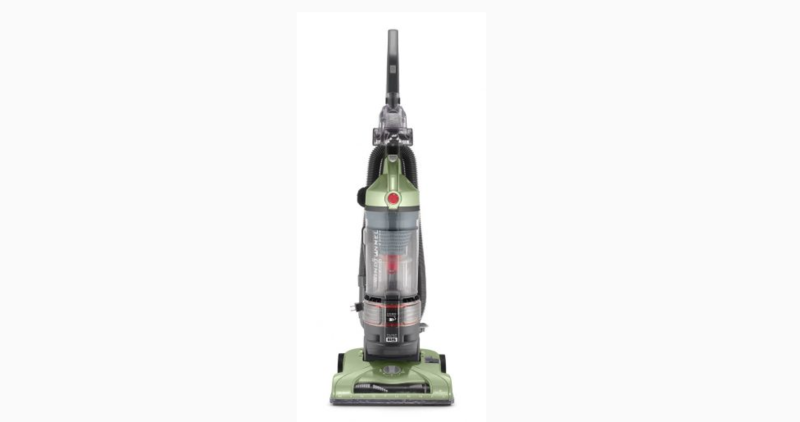 It comes equipped with a 2.5 HP motor, Makita’s Big Bore engineered pump (with a cast iron cylinder), and a 4.2-gallon twin-stacked tank. Like the Makita MAC700, it was designed to provide high levels of power while ensuring high durability in tough job-site environments. Like other oil-lubricated air compressors, the Makita MAC2400 operates silently (79 dB, at a relatively low 1730 RPM). It is also relatively more efficient, operating at half the RPM of other units while delivering 40PSI (4.8 CFM) and 90 PSI (4.2 CFM). While the Makita MAC2400 does not provide industrial output power levels, it is capable of handling the most demanding home tools: riveting guns, grease guns, plasma cutters, tire inflation tools, airbrush tools for painting, impact wrenches, and most pneumatic hammers and chisels (according to their CFM requirements). 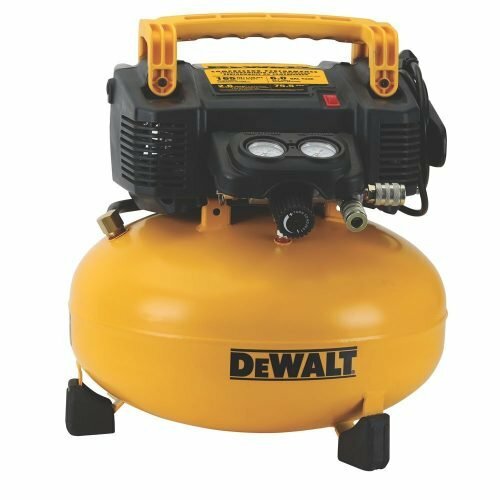 All these air compressors combine high functionality and quality – your choice of portable compressor ultimately depends on what home projects you intend to use them for. 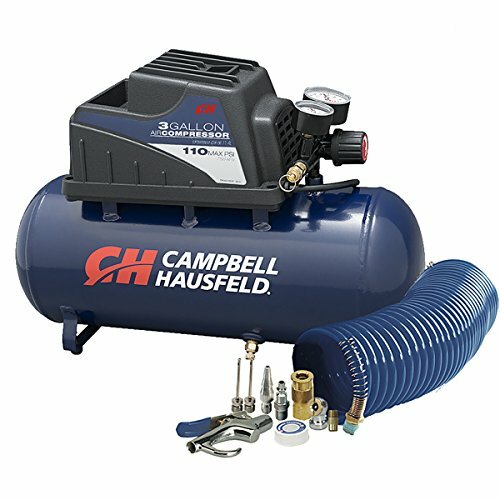 Do note that additional accessories and appliances can help bring out the fullest functionality of each portable air compressor.